Australia’s national market is currently in a stage of correction. 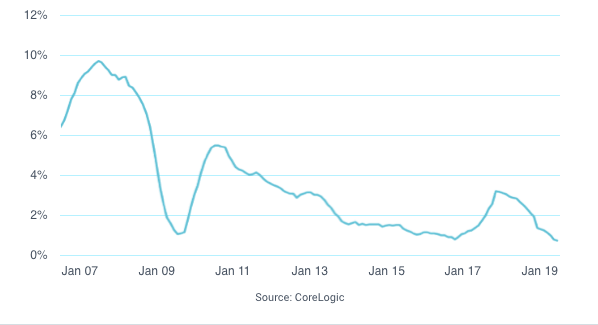 After moving through a period of strong and sustained growth, the housing market is experiencing a natural phase of stagnation. Primarily driven by the downturn in the Sydney housing market, Australia’s property prices are seeing subdued performance as it begins a process of recalibration. While this may urge some property investors to run for the hills, it is times like these that we at Blue Wealth understand there lies opportunity for our clients. 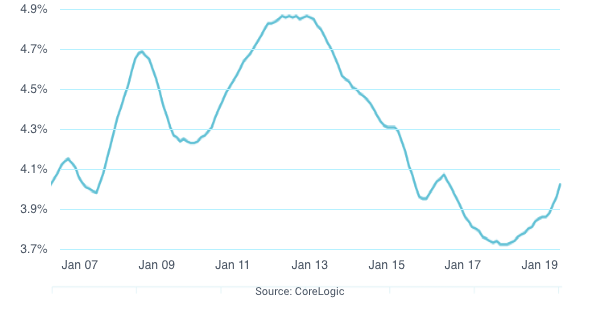 Data from CoreLogic shows the real movements in our rental markets over the last 12-months. While mainstream media has been focusing on the doom and gloom of the Sydney market, the rental position for landlords across the country has actually been transitioning towards a favourable position. Sydney’s rental market is slowing off the back of exponential rises (down 3% for the year) however, our national market is still rising by an average of 0.4% per annum (Figure 1). Further to the point, the gross rental yield for Australian landlords has improved significantly, moving from a decade low to the strongest rate since 2016 (Figure 2). As a result of these market movements, lower property values have produced higher yields for the average investor, as new properties can be purchased much cheaper than in the past. So, despite rents not growing, investment yields have risen – leaving new investors in a more appealing position to hold quality portfolios for the long term. Especially those who are investing in markets with sustained growth drivers, such as Brisbane and Melbourne. Although home values have fallen slightly on a national level, dwelling values remain 18% higher than they were five years ago – highlighting that most home owners remain in a strong equity position. Our property markets go through continual booms and busts, peaks and troughs. After strong periods of growth regularly comes market stagnation, and often natural phases of correction. It is in times like this, where our national market is moving through a slower period, that uneducated investors tend to panic. Before you make any rash investment decisions, it should be your prerogative to take a step back and look at the real data. In times like these, short term decisions can have long term consequences.